Our 3-day winter mountaineering course will help you develop your movement skills, looking at Grade I/II terrain (scrambling), basic rope-work, constructing snow anchors and abseiling with them, navigation strategies, avalanche awareness, weather and its implications for route choice. 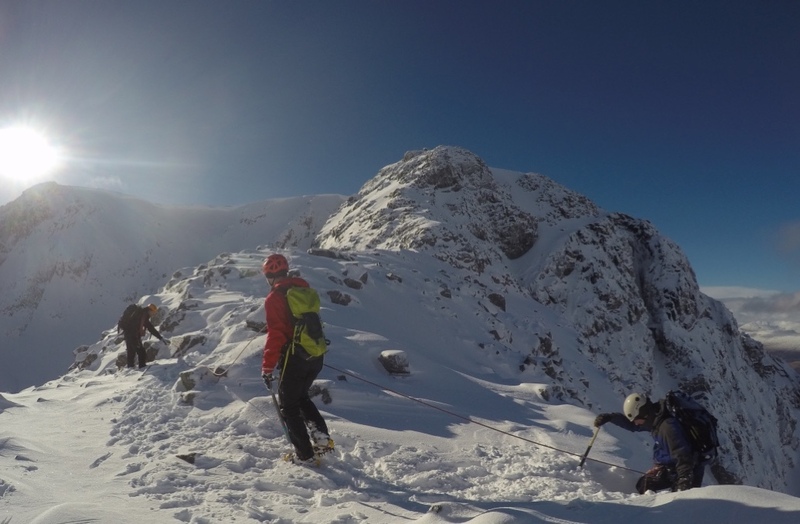 The winter mountaineering course is 3 days long, and is run in the West Highlands, using Fort William as a base. The client-to-instructor ratio does not exceed 4:1, to ensure that we can give you our fullest attention. This course is suitable for anyone who has had some winter hillwalking experience. We adapt the course to your specific requirements, though it’s as well to bear in mind that winter conditions in the Scottish Highlands can be demanding, and a fair degree of fitness and determination would be beneficial. If in doubt about whether the course is suitable for you, please don’t hesitate to contact us. Each day of our winter mountaineering course we would spend time assessing the weather, snow and avalanche conditions, in order to learn about safe route planning and detecting potential avalanche terrain. We will briefly look at ice axe and crampon use, movement on snow and ice, navigation and how to keep yourself safe in a winter environment. We will introduce rope work used in mountaineering and how to build anchors and when to use them. We look at consolidating the skills learnt on day one, and we go on a journey. Looking at some steeper terrain, putting some of the rope work skills into practice, and improving our personal movement on steeper terrain. We will look at consolidating all of the skills learnt, and will try and pass some of the ownership over to you, i.e. route planning. And will hopefully be venturing into Grade II terrain. Hopefully by the end of our winter mountaineering course, you will have the confidence to go out by yourself. The course content and location tends to be dictated to us by the weather, so the winter mountaineering course layout can change. If you are unsure whether the winter mountaineering course is suitable for you, please do not hesitate to contact us on info@riseandsummit.co.uk or call us on 07775 853 348, and we would be happy to help.